Â Welcome one and all to the last game of the 2018/19 season. A warm welcome to our final visitors of the season from Wellingborough. Welcome to Todayâ&#x20AC;&#x2122;s Sponsors M&M Estate Agents. Their support over many years has been of great benefit and we would like to thank you. Well that was a season in rugby. A difficult season it must be said but we have seen some improvements over the season. Unfortunately we will be playing at level 7 next season but already the coaching team are working hard to hit the ground running in September and the committee are doing everything we can to support them next season getting more people playing rugby at all levels. Thank you to John McDougal who steps down today as 1st team manager after many years. Your efforts are appreciated by all. John will continue to put in his match report on a regular basis. We are also drawing to an end of the mini and junior season and they have had another great year with more players enjoying rugby. The end of season celebrations start tomorrow with the young minis enjoying the presentation BBQ . Followed by dinners for the senior minis and the juniors. I am looking forward to attending all 3 and seeing the teams celebrate a great season. On a sad note the East Midlands RFU President Derek Hodgkinson died suddenly last week and we send our condolences to his family, Northampton Heathens and the East Midlands committee of which he was a large part for many years. Enjoy your rugby today and thank you for your support over the season. from their own half. As a result there was pressure on the defence which resulted in Towcestrians scoring two further tries in the fifteenth and twentyfourth minutes. With both converted, the home side led 21-7. Despite these setbacks, the final ten minutes gave apparent cause for optimism for the travelling support. Leighton benefited from a number of phases close to the line but were unable to score. Then Jack Whitehouse made an excellent break from his own half, linked with the supporting Harri Sayer, before winger James Pratt was tackled just short. The half ended with Buzzards on the attack again but without success, leaving the half-time score 21-7. Now playing down the slope and with the wind, Leighton were still very much in the game. This belief was enhanced five minutes into the second period when Adam Stacey broke clear from a lineout, fifteen metres from the line, to score his Adam Stacey second try. With James Brettâ&#x20AC;&#x2122;s conversion, Buzzards only trailed 21-14. This seven point gap was only to last five minutes as, with their first attack of the half, Towcester scored in the corner. With the excellent conversion added, the home side led 28-14.
of commitment and team spirit, the young Buzzard side did not concede until the thirty-sixth minute and then again with an interception try at the end of the game. These last two tries at the end of the match, when Buzzards were down to fourteen men, gave the final score of 40-14 a slightly misleading impression. Future Buzzards Under 12s Bucks Fizz for brave Buzzards Bruised, battered and bloodied, the team in the blue and white hoops did the club proud this morning over at Buckingham. Head Coach Harry Charter asked for three things from the boys; work rate, teamwork and commitment. Itâ&#x20AC;&#x2122;s fair to say every single player provided that (and more) on an overcast day against a much improved Buckingham side. The intent displayed by the boys was evident from the outset with James Crook leading the charge from the forwards, Billy Quinn marshalling the backline and Harrison Debbage-Price pulling the strings at scrum-half. The boys importantly demonstrated great resilience throughout the three 20 minutes played and refused to let their heads go down when conceding points. Archie Corkett made a long-awaited return to the squad after a season disrupted by injury. Harrison Debbage-Price was the first Buzzards player on the scoresheet quickly followed by William McAndrew who scored his first try in a Buzzards shirt (subsequently followed by a second later in the match). Sacha Page joined the scorers showing typical strength and elusiveness in his running. William Cooper picked up a brace with Jack Charter, a late replacement this morning, completing the scoring for Buzzards. Huge credit must to all the players for a true squad performance; Archie, Bertie, Billy, Isaac, James, Louie, Harry P, Jack, William P, William C, William Mc, Sacha, George & Harrison. almost always stand on the throwing in team’s side of the lineout. The logic is that the other side is more likely to offend and this is the best position to check for across line offences. The exception is when the lineout is within 5 metres of the try line, when they should always stand try line side – so if there is a grounding they are in the best position to see it. Two other observations on Adam’s disallowed try – Firstly whilst I was on the touch line 40 metres away I “knew” it was a try from the body language of both Adam and Towcester players. With experience the ref will develop that sixth sense. Secondly at top level the refs don’t get goal side anymore because they have TMO’s – I just wonder if our refs are copying the positioning they see on TV. Buzzards Front Row To Be Strengthened Next Season! Future Buzzards Buzzards Under 18s Leighton Colts travelled to Brackley for a three counties Barbarian friendly hoping to keep their perfect post Christmas record intact. The early stages belied their recent form with a slow start blighted with sloppy tackling and handling and consequently gifting the young Brackley side an early try. However, after some soul searching the visitors began to up their game and it was George Pratt who linked well with Max to put the dynamic full back into space which allowed him to score under the posts. Sam Beaumont was strong in the centre and put in some thunderous tackles leading to turnovers and forcing the Brackley side to kick away possession. But it was Brackley who scored next after some strong forward play to regain their early lead. Immediately from the restart, Rhys Richards drove forward from the kick off and made 30 metres before offloading sublimely to the supporting Jacob who touched down and equalised the score. The game became scrappy after several injuries and it was the Barbarians who pounced on the errors. Dane Richards collecting the loose ball and passing superbly to the powerful Julian Gallie who seared through the Brackley defence to score the try of the day. The remainder of the match became a much more one sided affair with the visitors over powering the home side. Further tries from Edwards, Gallie and Max gave the Barbarians a comfortable, if not beautiful, win of 47 to 21. Having the right team can make all the difference Get in touch with us FRP Advisory, your local restructuring, recovery and insolvency specialist, is proud to support the Buzzards We provide decisive, positive and commercial solutions from start to finish. I’ve got some good news and I’ve got some bad news. The bad news is - I’ve not been able to solve Brexit. But the good news is I’ve solved how to solve it. This is to do with MPs what happens with the Cardinals when they elect a Pope - lock them all in a room and only let them out when they’ve made a decision. However, in this case, I wouldn’t let them have any food, drink, drugs, hookers or rent boys until they do! That should both shut them up and focus their minds. And, there’s more good news. My research reveals that, if there’s no Brexit deal, there’s at least a month’s stock of Guinness and six weeks of Peroni in the country but there may be a shortage of Feta cheese - so, why all the angst? It all depends on the shelf life, meaning there won’t be any storm in the Port market. As to potentially having to vote for MEPs, as an exercise in futility, I’m conflicted whether to turn up and boycott it or vote for the maddest or baddest candidate available. Now that Rugby Australia has made him available, I’m hoping Israel Folau will be one of our candidates! So as to ‘Brexit-dodge’, a friend of mine has taken himself off to the Bavarian Alps to sit it out. I’m not saying that my mate’s politics are either right wing or militaristic but the last person who tried to unite Europe and do so by force also had a holiday home in Berchtesgaden! Meanwhile, last weekend saw three of our nation’s great annual sporting events, the Boat Race, the Grand National and the FA Cup semi-finals. I’m afraid to say that my interest in the Boat Race has waned in recent years. Firstly, unlike the FA Cup, they never televise the semi-finals and, secondly, I never know which team to support, as I went to both Oxford and Cambridge; albeit that I went to the former on the 4.45 from Paddington and the latter on the 3.30 from Liverpool Street. Thirdly, the event needs a bit of pepping up. I suggest lining up the students from one university on one bank of the Thames, those from the other on the other bank and arming them with AK47s and RPGs, which they fire at the opposing university’s boat as it passes. Now, that would be worth watching! Otherwise, the Grand National was the usual betting fail. Put it this way, I once bet on a horse that started at 10 to 1 and finished at a quarter past 2! As to the FA Cup, Watford, the town of my birth, got through to the final for only the second ever time. I don’t think I’ll be going this time, as last time, on 19th May 1984, I got done for drinking and driving on the way back. This was not my finest hour but what really peeved me off was that a year before when, in June 1983, I was expelled from school, the headmaster predicted that I’d be in court within a year. My case was heard 364 days afterwards! Let’s face it, whilst going to court was never so, it was just the timing that was in doubt! Oh, so near. Have a good summer. 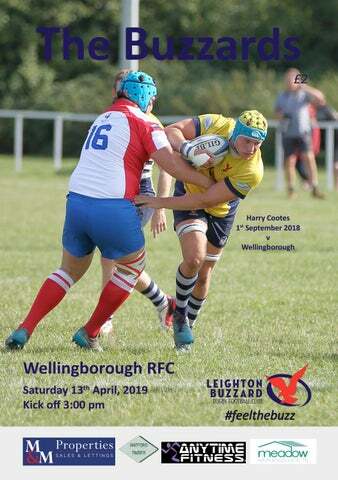 Man of the Match Award Both visiting and home supporters will be able to vote for their “Man of the Match” in all Leighton Buzzard 1st XV home Games this season. To vote please complete and detach the voting slip below and place it in the box on the bar after the final whistle. Once voting has closed, the votes will be totted up by an almost independent adjudicator and the winner will receive their award in a short presentation. This award is open to both Buzzards and their opposition so please vote fairly and only vote once. We are very thankful to M&M Properties for sponsoring this seasons man of the match awards. Leighton Buzzard RFC - Man of the Match Award 2018/19 In Association with M&M Properties. Blessed are those that can give without remembering, and take without forgetting. One day a florist went to a barber for a haircut. After the cut, he asked about his bill, and the barber replied, 'I cannot accept money from you, I'm doing community service this week.' The florist was pleased and left the shop. When the barber went to open his shop the next morning, there was a 'thank you' card and a dozen roses waiting for him at his door. Later, a cop comes in for a haircut, and when he tries to pay his bill, the barber again replied, 'I cannot accept money from you, I'm doing community service this week.' The cop was happy and left the shop. The next morning when the barber went to open up, there was a 'thank you ' card and a dozen doughnuts waiting for him at his door. Then a MP came in for a haircut, and when he went to pay his bill , the barber again replied, 'I cannot accept money from you. I'm doing community service this week.' The MP was very happy and left the shop. The next morning, when the barber went to open up, there were a dozen MPs lined up waiting for a free haircut. And that, my friends, illustrates the fundamental difference between the citizens of our country and the politicians who run it. As Margaret Thatcher said: Both politicians and nappies need to be changed often and for the same reason!